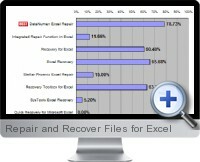 Repair and Recover Files for Excel is a powerful tool to repair corrupt Excel files. It scans the corrupted Excel files and recovers as much data as possible to minimize the loss in file corruption. Support to fix Excel xls and xlw files in Excel version 3, 4, 5, 95, 97, 2000, XP, 2003 formats. Support to repair Excel files on corrupted media, such as floppy disks, Zip disks, CD ROM, External hard drives, etc. Support to recover formulas in Excel files. Support to repair a batch of Excel files. Supports integration with Windows Explorer, so you can repair Excel files within the context menu of Windows Explorer easily. Supports drag and drop operation.